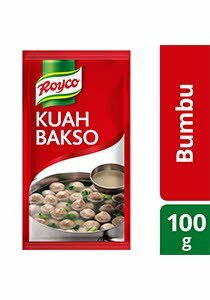 Made from selected beef fat & beef bone marrow flavour, to deliver rich umami taste & aroma of the beef bone marrow to your Bakso soup. *List price (including 10% VAT): this price is just an indication of a possible resale price of your selected trade partner, included for indicative reference purposes only. Your actual purchase price is subject to the agreement between you and your selected trade partner, and could thus be lower or higher. Salt, sugar, flavour enhancer (monosodium glutamate, disodium inosinate&guanylate), maltodextrine, beef fat (5.8%) (contains antioxidant tocopherol), corn starch, natural identical bone marrow flavour (contains gluten and soybean), colorant caramel class I. Produced with the same equipment with product contains egg, shrimp, soybean, milk and celery.